Hitting the charts right out of the gate in their Swedish homeland with their 2009 The Darkest Room debut album, it’s been six years to reach for the follow up currently under the microscope. 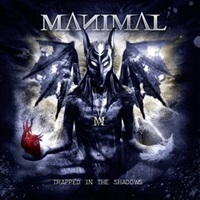 With a new rhythm section in tow (welcome bassist Kenny Boufadene and drummer André Holmqvist), Manimal’s lean hook-oriented material straddles the lines of late 80’s and early 90’s traditional/power metal with nods to proven long-time headliners of the current crop in this scene. 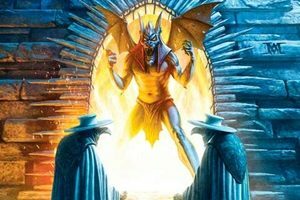 It’s quite obvious after a few spins for the 10 songs on Trapped in the Shadows that Judas Priest, Queensrÿche, and a little bit of Accept/Primal Fear appreciation takes place in the riffing, tempos, and high octane vocal parts. Singer Samuel Nyman could certainly helm the iron microphone when Rob Halford chooses to retire – one airing of his eagle soaring notes during the title cut proves his lung capacity and sustainable note holding are the stuff that put Scheepers, Dickinson, and Tate in legendary status mold. Guitarist Henrik Stenroos handles his riff duties with heads down excitement – a love of Painkiller obvious during the six minute “Irresistible” opener, while reaching into slightly modern meets semi-classic doom pastures for “Man-Made Devil” (love the spooky keyboard tinges during the concluding moments for the latter). Many will love the furious, driving nature of cuts like “March of Madness” or the double bass propelled “Silent Messiah” that are sure to charge up audiences if Manimal places these tracks in their live presentation. Guest vocals from Udo Dirkschneider on the ballad “The Journey” is left of center – but many forget that he is quite capable of singing in lower register convincingly, and Samuel can handle all the mid-range and high melodies just fine for this emotional number. Seasoning mixing and mastering by Achim Koehler ensures that right crunch and tone balance as the band hits a comfortable, dynamic stride from the first note to the final clean guitar ring out on closer “Psychopomp”. If early Primal Fear, Infatuator from Silent Force, and the aforementioned Painkiller matter to you along with a dose of late 80’s/early 90’s Queensrÿche – Manimal will unquestionably meet your approval.